← Did your cake stick to the pan? 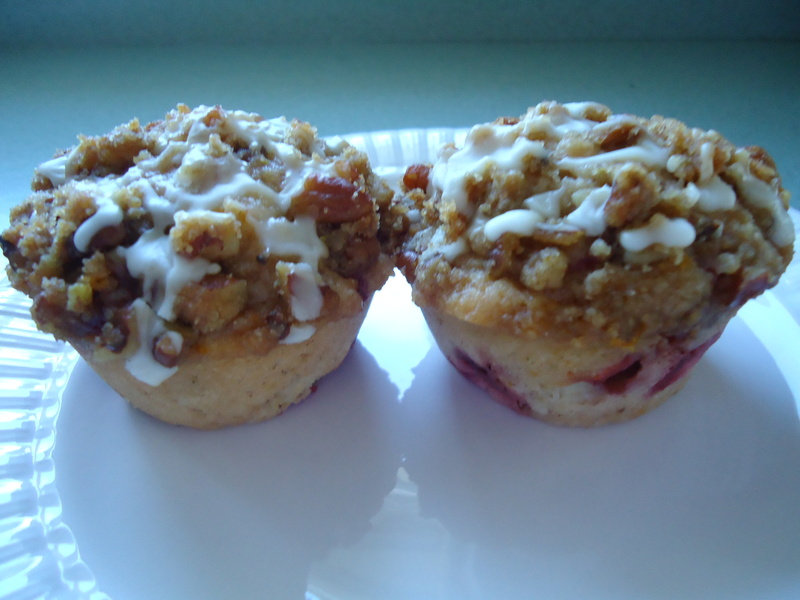 This strawberry streusel muffin recipe is one of my family’s favorites! I make it a couple of times during strawberry season with the best berries Florida has to offer! This recipe I got from a cookbook dedicated to the luscious red berries – Simple Strawberry Sensations! by Laura York, a former meteorologist in Tampa. Over time, you’ll see I’ll post other recipes from this book. But first, let’s talk about these muffins. Although they are a bit involved to make they are well worth the effort. Originally the recipe called for sliced strawberries but, after making them a couple of times, I decided to chop them. The muffins tend to fall apart when the berries are sliced, especially if the berries are big. For a different twist on the icing, substitute lemon juice for orange juice. Both are good. In a medium bowl sift together the flour, sugar, brown sugar, baking powder, salt, cinnamon and nutmeg; set aside. In a small bowl combine the egg butter and half and half. Mix well. Pour the egg mixture into the flour mixture and stir just until moistened. Fold in the strawberries and orange zest. Spoon into 12 greased muffin cups. In a small bowl combine the pecans, brown sugar, flour, cinnamon, nutmeg and orange zest. Mix well. Stir in the butter and mix well. Sprinkle evenly over the muffins. Gently pat mixture into muffin batter to help make it stick. Bake for 20 to 25 minutes or until golden brown. Remove from oven and cool completely on wire rack. In a small bowl combine the powdered sugar and orange juice, mixing well. Drizzle glaze over cooled muffins and ENJOY! This entry was posted in Breakfast, Company Worthy, Muffins. Bookmark the permalink.